I don't want to be Captain Obvious, but don't forget you can turn in stone keeper shards for honor, and then honor for uncut purple gems. I end up with a lot of shards just from running heroics. I'm no PvP expert, but I think Alliance needs to control Wintergrasp in order to obtain said gems. That doesn't happen often on my server. =( Thanks for reminding me about that, though. I'd completely forgotten! You can also buy epic gems for 20 badges form the badge vendor. I also disagree with some of your choices for enchants or glyphs. I rarely ever have mana issues on my resto shammy (Healistic on Shadow Council). In saying that the +10 stats is the way to go for your chest enchant. Also as you get into raiding more having your ES up on the Main tank is invaluable so the ES glyph is the way to go. You will use lesser healing wave but the majority of your helaing will be chain heals. 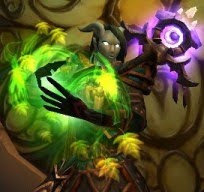 In my raid group I am usually reponsible for healing the melee so I generally bounce my chain heal off the MT or OT. I basically use 3 gems only, Quicks king Amber for yellow sockets, Runed Cardinal Ruby for red socket and Lustrous Majestic Zircon for Blue sockets. I also have enchanted my helm for crit as I have the 4 Piece T10 Bonus which rlies on you to crit with your Chain heal for the proc. So in this case crit is becoming more important to me. I also have an enchanting alt so hit me up if you see me on line and I can set you up. @Chris: Thank you for your input. This is still very much a learning experience for me, so I'm still in the process of figuring out what works best for me. Thanks for the enchanting offer as well. =D Same goes for you if you need glyphs.